Bash is the default shell on Linux. If you are spending lot of time on Linux environment, you should master the Bash command line features to become efficient. Apart from being an interactive shell, Bash is also a scripting language, which allows you to automate your tasks using Bash shell scripting. 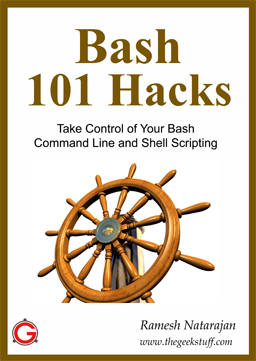 Bash 101 Hacks is a downloadable eBook that contains 101 practical examples on both Bash command line and shell scripting, and I promise it will help you understand everything you need to know about Bash. This book contains a total of 276 pages, that explains the following. Chapters 4 – 6 cover various Bash conditional commands, looping structures, various Bash builtins, and Bash array manipulation. Clear examples are provided. Bonus #2: Book companion. All example scripts shown in the book are bundled in a single tar file. For the regular readers of TGS, I’m giving a huge 25% discount, which is available only for the first 50 buyers. 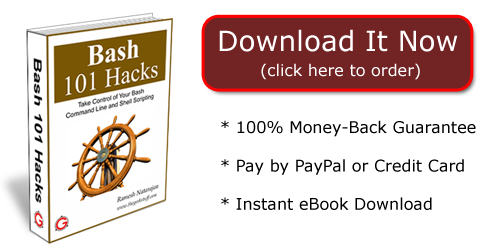 PS: I’m so confident that this book will help you master Bash, I’m giving 100% money-back guarantee. If you are not satisfied with the book, just let me know and I’ll refund your money. PPS: 25% discount is only for the first 50 buyers. If you’ve been thinking about mastering Bash command line and shell scripting, this is the right time.